I think the photo below, taken by David Sinclair in 1996, makes the point that this is a real railway despite the narrow gauge. Single lines have been operated safely using a variety of techniques, such as some form of physical token, or more recently radio control from a central point. However, the paper train order system has been common in many countries. Under this regime a series of precisely specified questions and answers are passed between controllers at either end of a section. Once the controllers are satisfied that the section can be operated safely they can issue a paper train order to each driver. In some cases there will be unmanned passing loops within the section. In this case a driver will only receive permission to proceed as far as a specified loop, there to await the arrival of a train in the opposite direction. Commonly, the order granting permission to proceed further will be carried on that other train, to be handed over at the passing point. On the RFIRT this practice was known as the 'Vía Libre' system, equating to the phrase 'Line Clear' used in Britain. The sequence of conversations between the control office and a station assistant to complete the necessary forms was laid down in the rulebook in great detail (1). 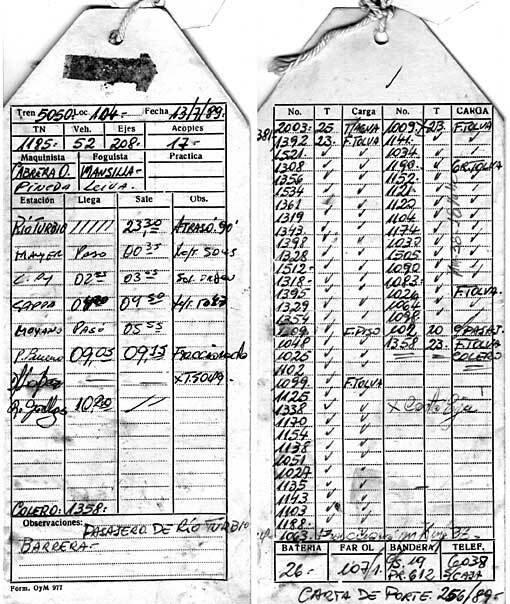 Below are samples of the train orders and weighbills used on the Río Turbio line, at least until recently. The first order is for the most straightforward case. It gives permission for the driver of train 5055 on locomotive 115 to proceed from Río Gallegos to the station of Luis Puedra Buena. The controller has added no special observations. At the foot of the page is the name of the station giving permission for the train to enter the section, in this case L. Piedra Buena, and a reference number - 10. If circumstances required it, a 'Vía Libre with caution' form would have been used instead to alert all concerned to a speed restriction, station in advance obstructed or whatever. These were usually on green paper (form E31) but the one below was from a pad of white sheets. In the third case, below, a distinctive type of form (E52 on red paper) is used when the train is to halt at a station and await an opposing train. This form was made out at Comodoro Py for train 5052/loco 101 to proceed to the station at Ing. Cappa, there to await and cross train 5053/loco 108. The necessary permission had been given to the staff member at Ing. Cappa at 1317 hours, and he had been given the reference number 68 for the transaction. The next form was used in special circumstances, when a Vía Libre form was to be over-ridden. The circumstances leading to the issue of the one below have not been recorded. On the Río Turbio line the train weighbill doubled as a check on each of the events in a train's progress. 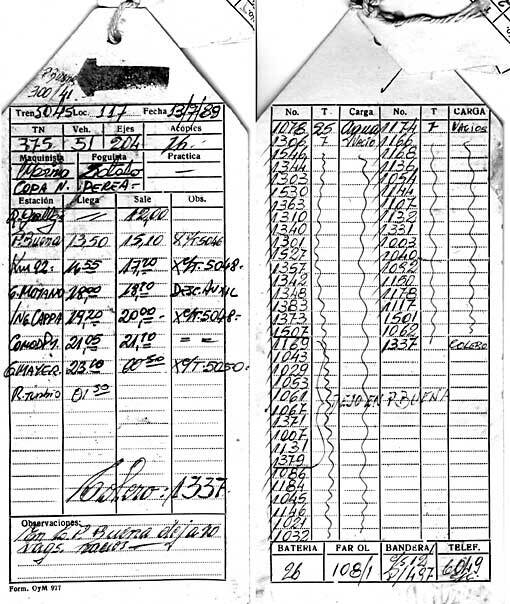 On one side of the form (below right) is a list of the wagon numbers in the train, with their types, loads and gross weights. On the other side (below left) are the train number, loco number and date, followed by the total tonnage, number of wagons, number of axles, and the number of vacuum-fitted wagons providing braking power at the head end. Then come the names of the driver, fireman and trainee if applicable. The rest of the card charts the train's progress as it arrives and departs from each station, and when it crosses another train. The first weighbill is for a train of empties travelling west (note arrow pointing left at top of card) from Río Gallegos to Río Turbio. Train 5045 with loco 117 consists of 51 wagons, of which the first is a water tanker and the last is one of the specially painted 'tail-end' or 'colero' wagons. Being empty the load is only 375 tons and there are 16 braked wagons next to the engine. 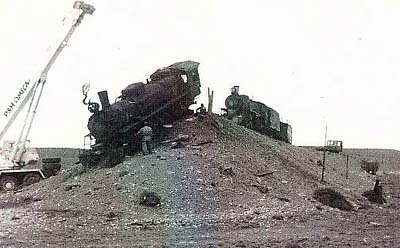 The train departed from Rio Gallegos at 1200 lunchtime; it crossed opposing trains on four occasions, and it reached its destination at Río Turbio at 0130 hours. The second example is from a loaded train travelling eastbound. In this case train 5050 with loco 104 took 52 vehicles totalling 1185 tonnes. Driver ('maquinista') Cabrera and fireman ('foguista') Mansilla formed the first crew, replaced by driver Pineda and fireman Leiva at Gobernador Moyano . 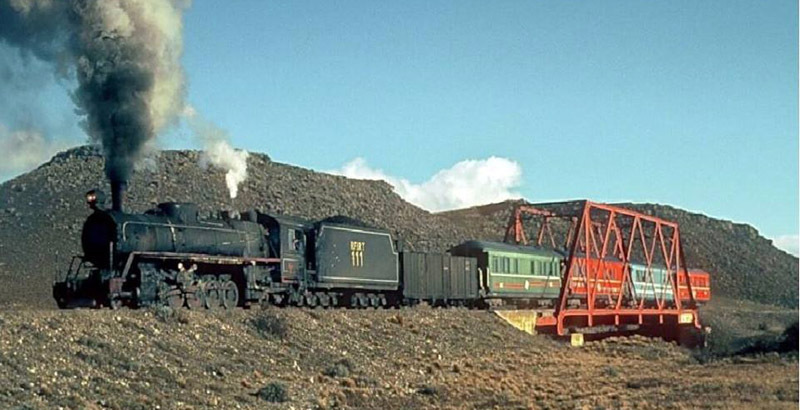 There is the usual water tank next to the engine, followed by the normal 50 wagons of coal but with a passenger car cut in near to the 'colero' wagon. The inscriptions 'F.Piso' and 'F.Tolva' refer, I think, to the nature of the coal loaded. In this case the journey took 10 hours 50 minutes, from 2330 to 1020 the following morning. Main crossing points were equipped with passing loops as is normal, with left hand running being the usual. However, as it became clear that staff in isolated stations could be minimised, the railway increasingly developed a system of trailable points so that two trains could cross without any member of staff having to set foot on the ground. In the early days crossing points on steep gradients against the loaded train also had dead end sidings so that empty trains would steam into the dead and then reverse out again after the opposing loaded train had passed. This was supposedly to minimise the danger of an empty train over-running a loop. As the mine grew in size, so the population grew, largely through the arrival of Chilean immigrants. To house these newcomers a new community developed at 28 de Noviembre, originally La Dorotea, just down the valley from Río Turbio itself. As there were few good roads the railway provided a passenger service for some years, using Henschel 2-8-2s until the late 1960s with some of the 1922 Familleureux coaches, then with a variety of coche motor until eventually buses took over the task. In the early days, when Río Turbio was cut-off from the outside world by roads that were impassible due to snow or heavy rain, the railway provided a passenger and goods service for the whole community. 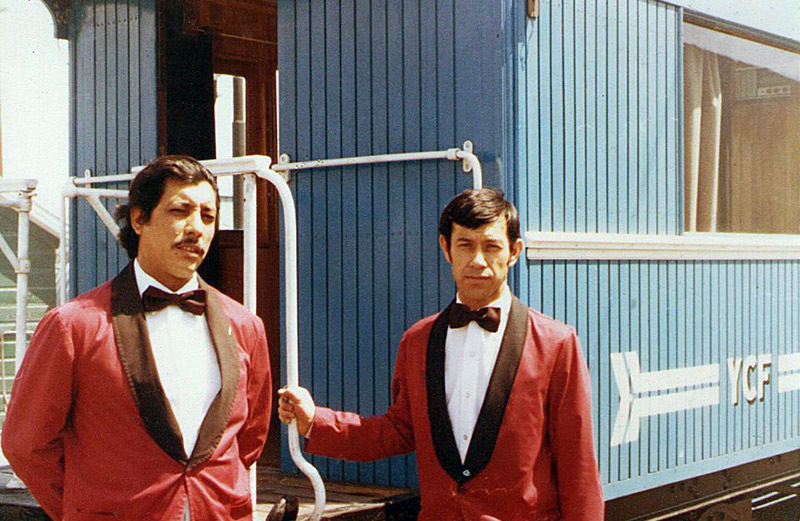 In this view the crew pose outside the blue painted coach which is serving as a restaurant car, the initials YCF on the coach making it clear that it is the coal mine's. There had also been a roll-over accident near Río Turbio in 1959, caused by an unstable embankment collapsing. Thanks to Héctor Guerreiro's posting on Facebook we have this areal view (actually from the top of the coal washing plant), taken in 2014, showing the main marshalling yard, for both incoming, empty, trains and outgoing, loaded, trains. 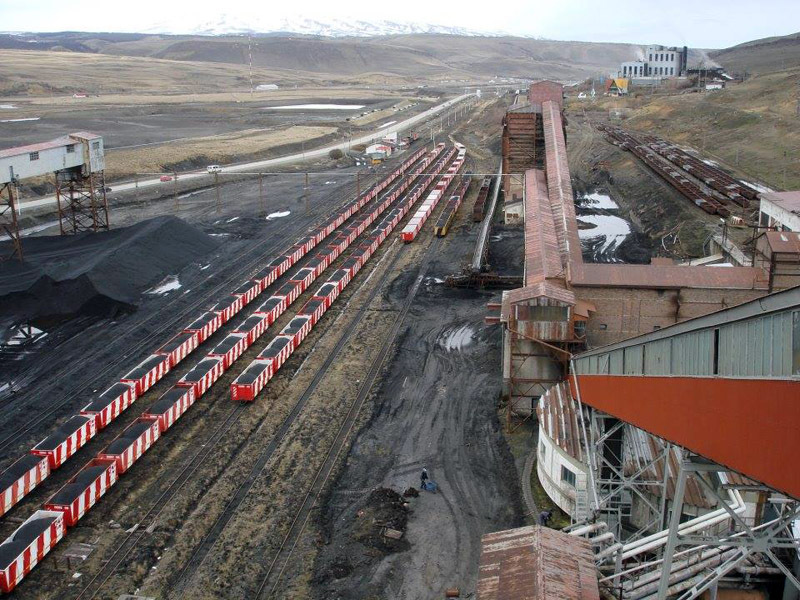 To the right of the coal conveyors, at a higher level, some 4 km by rail(! ), is the original terminus of the line with a yard for sorting mine tubs. The station buildings and control room lie between the end of the lines of wagons and the road. The new high visibility livery of the wagons can be seen clearly. The now privatized railway has introduced a form of centralised traffic control. This involves the use of radios. The system described above is therefore no longer in operation. The forms displayed on this page were kindly loaned for scanning by David Sinclair, who also helped to interpret the more indecipherable bits! 1 FCIRT Reglamento de Explotación Ferroviaria. 1979. Rulebook prepared under the supervision of the line's manager, Ing. Ariel Miranda. 2 Found on Facebook (6/7/15, no longer available). 3 Found on Facebook, Héctor Guerreiro (11/9/16, no longer available). 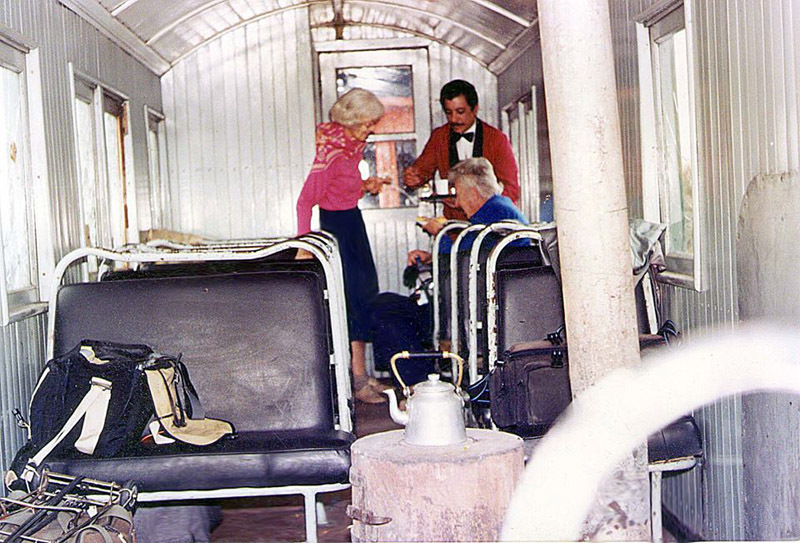 4 El Tren del Fin del Continente, a CD-ROM of photos collected by the Amigos del Ferrocarril in Río Gallegos. 2000. Edgardo F. Gallardo. E-mail him (in Spanish) at <tandem@ciudad.com.ar> for details. 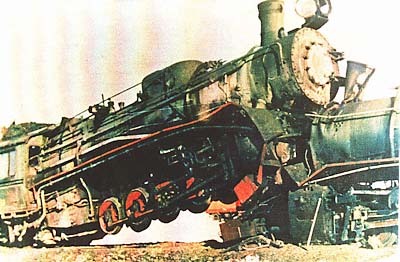 5 RFIRT, el más austral, Pablo Jäckel, Gaceta Ferromodelista, October 1974.